Les Contamines boasts exceptionnel snow conditions for 120 km of pleasurable skiing opposite Mont-Blanc ! Located between 1,200 and 2,500 m altitude, on the border between the Savoie and Haute Savoie, the ski resort of Les Contamines is suitable for every level of skier. With exceptional snow cover and sunshine, the site offers wonderful panoramic views of the Mont Blanc and Beaufortain mountain ranges. 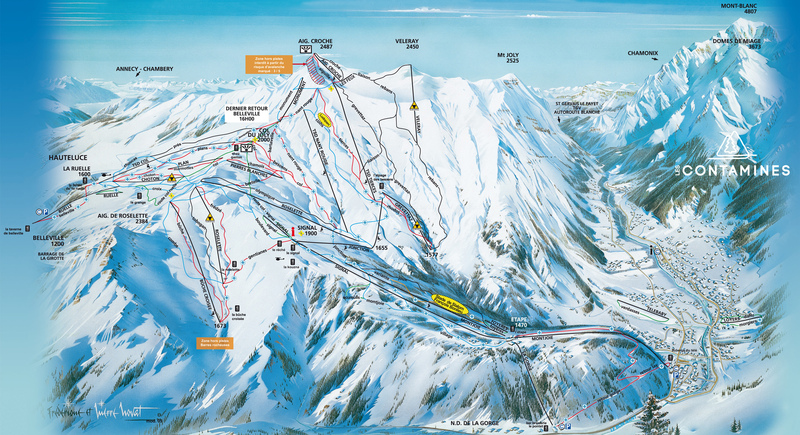 The ski runs wind down between valleys, wide slopes, trees, chalets and alpine farms. The village is located on the edge of the Mont-Blanc range. The highest part of the ski area boasts beautiful views of the Mont-Blanc range whilst the lower part runs through the trees. 120 km of ski slopes facing in all directions. 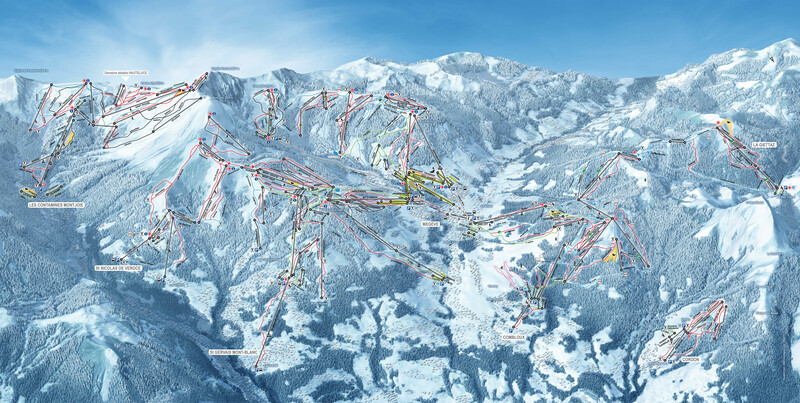 25 ski lifts including 4 gondolas, 5 modern chairlifts, 3 other chair lifts, 12 drag lifts and 1 rope lift. 2 beginners’ areas in the centre of the village: the “Loyers” and “Nivorin” slopes. Both slopes are equipped with a drag lift and accessible with a ski pass or tickets. A “Ludoparc”, a fun ski area for all the family. The resort is also part of the Evasion Mont-Blanc ski area : 445km of slopes that run across 6 different resorts in the area : Saint Gervais, Megève, Saint Nicolas de Véroce, Combloux and la Giettaz.